After Japan’s Fukushima nuclear disaster in 2011, for example, robots were sent into the power plant to clear up radioactive debris in conditions far too dangerous for humans. The problem, says robotics researcher Professor Jean-Baptiste Mouret is that the robots kept breaking down or came across hazards that stopped them in their tracks. As part of the ResiBots initiative, he is designing a lower-cost robot that can last long periods without needing constant human maintenance for breakages and are better at overcoming unexpected obstacles. The ResiBots team is using what it refers to as micro-data learning algorithms, which can help robots adapt in front of one’s eyes in a similar way to how animals react to problems. An animal will, for example, often find a way to continue moving if they get injured, even if they don’t know exactly what the problem is. In contrast, most current robots self-diagnose a problem before working out a way to overcome it, says Prof. Mouret, principal investigator at ResiBots and a senior researcher at the Inria research centre in France. ‘We’re trying to shortcut this by finding a way for them to react without necessarily having developed an understanding of what’s wrong,’ he said. Rather than self-diagnosing, the aim for these robots is to learn in a proactive way by trial and error what alternative actions they can take. This could help them overcome difficulties and stop them from shutting down in situations such as disaster scenarios like Fukushima, said Prof. Mouret. This may not be full artificial intelligence, but Prof. Mouret points out that having knowledge of everything is not essential for getting a robot to work. In one of the most promising approaches developed in the ResiBots project, the robots have a simulated childhood, in which they learn different ways to move their body using an algorithm that searches ahead of time to collect examples of useful behaviours. This means that when seeking a way to move, the robots need to choose from one of about 13,000 behaviours rather than an estimated 1047 options that standard algorithms could select from. And the aim is for them to try only a handful of these before finding one that works. Most of ResiBot’s tests are currently being carried out on a six-legged robot that seeks to find new ways to move after having one or more legs removed. In the latest trials, Prof. Mouret said the robots learned to walk in one to two minutes after one of their legs was taken off, meaning they generally need to test fewer than 10 behaviours before finding one that works. In total, the researchers are working on half a dozen robots at varying levels of complexity including a child-like humanoid robot known as iCub. Though the much more complex iCub is not yet being used in many trials, the team hopes to do so more over time. There are, however, some big challenges still to overcome, including the fact that a robot needs to be moved back to its starting position once a limb is removed, rather than being able to carry on from the injury site towards the target. 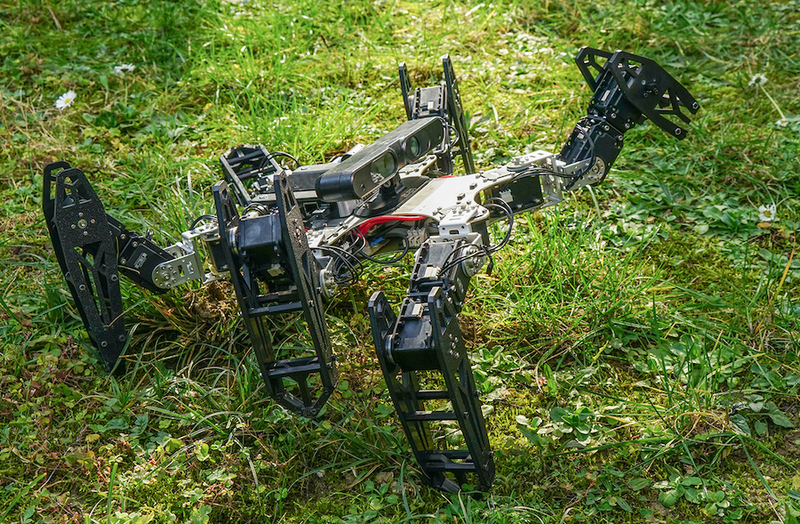 There are also wider safety issues involving such robots – for example, ensuring that they do not harm earthquake survivors while rescuing them, particularly if the robot is learning by trial and error, said Prof. Mouret. He believes it will be at least four or five years before such a robot could be used in the field, but is hopeful that the techniques can eventually be employed in all types of robot – not just those for disaster situations, but in the home and other scenarios. But it’s not just mechanics that can help robots navigate the real world. Robots may also adapt better if they can more strongly connect language to reality. Professor Gemma Boleda at the Universitat Pompeu Fabra in Spain, has a background in linguistics and her team is trying to link research in this field to artificial intelligence to help machines better understand the world around them, as part of a project called AMORE. It’s something that could be useful for making technology such as GPS more intelligent. For example, when driving in a car, the GPS system could specify that you turn right where ‘the big tree’ is, distinguishing it from several other trees. Prof. Boleda says this has been hard to do in the past because of the difficulty of modelling the way humans link language with reality. ‘In the past, language had largely been represented out of context,’ said Prof. Boleda. AMORE’s aim is to get computers to understand words and concepts in a real-world context rather than as individual words in isolation, she says. For instance, a robot would learn to connect the phrase ‘this dog’ with an actual dog in the room, representing both the words and the real-world entities. Giving machines a better understanding of the world around them will help them do ‘more with less’ in terms of the amount of data they need and get better at predicting outcomes, Prof. Boleda said. It could also help with the issue of having enough physical space on devices like mobile phones for the next wave of intelligent applications. The research in this article was funded by the EU’s European Research Council.